Microsoft’s (s msft) smartphone strategy isn’t yet paying off in terms of sales, market share or user adoption, at least not from any measurable statistics, which are far and few between. The company hasn’t offered even the slightest hint at sales figures for handsets running its new Windows Phone 7 operating system. But by looking at statistics outside of Microsoft and retail channels, we can at least get a glimpse of how Windows Phone 7 is doing. Chitika released data late last night showing Windows Phone 7 activity on its advertising network is barely measurable. In a blog post, Chitika, which serves more than a billion ads monthly across 100,000 websites, says for every one network ad impression on a Windows Phone 7 handset, it sees 110 impressions from Android (s goog) phones and 172 from iPhones (s aapl). These results are from the prior three weeks and incorporate handset data from more than 31 million ad impressions during that time. Clearly, any new smartphone platform won’t initially compete with strong-selling incumbents, so we can’t read into this limited data too much. But at a minimum, it lends credence to rumors and grumblings that Windows Phone 7 devices may not be selling well just yet, and it provides a nice baseline for future research. Early analyst projections indicated that 40,000 Windows Phone 7 handsets were sold on the initial launch day last month. The devices are only available on two of the four major carriers in the U.S., which also limits potential sales, and Dell (s dell) is facing production delays for one Windows Phone 7 model. And although it’s the holiday season, I’ve never seen price cuts and “buy one, get one” free offers for any handset system so quickly before now, yet I’ve recently noticed several such deals for the one-month old platform. The main problem for Windows Phone 7 may not be in marketing and availability, however. Although the platform has a refreshing user interface that differs greatly from competitors, my hands-on experience shows that Microsoft still has much room for improvement in Windows Phone 7. Some standard features on competing phones won’t be arriving on Microsoft handsets until next year, for example. And by comparison, the Windows Marketplace app store is lacking, even though a large number of developers say they’re interested in the platform; in recent surveys, 20 percent of programmers plan to code apps for Windows Phone 7 next year, which is the same number planning to make iPad (s aapl) apps. To be sure, Windows Phone 7 has a long road ahead of it, and Microsoft appears committed to the journey. Handset sales are expected to overtake traditional computer sales by 2012 and Microsoft can’t afford to stay out of this market so it’s likely to follow the same strategy it has with its Xbox: keep pouring money into the effort until it finally becomes profitable. Early data, however, suggests that Microsoft could be traveling down this path for many years to come with Windows Phone 7. Could Games Redeem Windows Mobile and Palm’s webOS? There’s an important distinction between an iPhone, Android, and WP7. With an iPhone, a consumer is purchasing a phone with the ios operating system. They know exactly what they are getting because the Apple marketing machine promotes the phone as an all-in-one, complete phone system. With Android and WP7, the consumer has to review each phone and its implementation of the Android and WP7 features to decide between one Android (or WP7) phone and another. This point is really different from Windows & PC world of yesteryear. Put two Windows PCs next to each other and the user interface and features are 99% the same. The differences are limited to hardware specs (ram, hd space, graphics cards, etc). Put two Android phones from the same manufacturer side by side and you see two entirely different phones, feature sets, etc. As Steve Jobs said, earlier, its a fragmented strategy vs. an integrated one. To be honest, MS should follow the successful strategy of the Xbox and produce their own smartphone and create their own ecosystem (like Xbox Live)…manufacture the phone(s), develop a market place, AND effectively link the phone with the cloud (public and private) to capture the consumer and business space. How many YEAES ago was it that the iphone was launched? How long ago was it that the iPad launched? How many MSFT shares did Ballmer sell? Ballmer is a follower and Microsoft, not to mention the WP, will be the looser. There are no “android” phones anymore, except maybe a very new one, I hear. Anyway, there are lots of phones running the free Android OS, which kind of fractures Android. There are millions of iPhones and even more IOS devices running on iPads and iPod Touch. So, are you measuring actual phones or software? As far as I know, Google makes money off Android through access to mobile advertising. That’s not the same thing as an Android phone. iPhones, Rim phones, and the rest of the hardware phone world: these are phones. EDD is profitable. Big difference. Please provide actual evidence Xbox is making a profit. Especially since BOTH the Windows and Office monopoly RETAIL sales are now in the EDD division. Especially relevant this year with Win 7 and the debacle of Vista creating a backlog of pending upgrades. I know! Let’s see who can be the first to use the word “fanboy”, as if it were not a fanboy word. You can’t really tell Microsoft’s vision from a 1.0 product (they are basically jumping back into the game with wp7) As a major operations supply company, they have to have a mobile operating system in their stable so they aren’t going anywhere. WP is a new product that will take 2 more versions to include the real usability, consumer app store and enterprise functionality microsoft is known to bring at some point, in the meantime they will remain in the game and get market share just by being there like usual until the product can get up to speed. From a dev perspective, they essentially shunned the developer community from the previous mobile platform from the technology shifts, so there is an initial desire by developers to drop support. After a couple years of continuing maturing eco-system, and bringing in a new generation of mobile windows developers who they can reach with their long term ‘fun’ development initiatives, along with adding the full enterprise experience will re-enforce commitments from the big developers. And then the whole compact embedded white-box story could play into the shape of the long term community. I guess I’d say all 3 of the current players have deep pockets and a lot of back room relationships, palm has a new owner with deep pockets, all these companies have big visions, new OS updates every few months, its still the wild west, no reason to think anything is going to be settled way back here in 2010/11. I think you’re completely out of touch. There has been more software written for WP7 in the last month than there was for Mobile in the previous year. I’m pulling that number out of thin air, but it’s derived from the fact that the developer community doesn’t talk about the old platform. Ever. Today, there is no shortage of forum posts, blog entries, etc. Are you referring about the enterprise space? The previous developer community was targeted largely to enterprise use, so those would be the developers being affected (eg supporting 2 different applications, for new and old devices etc). Perhaps there aren’t metrics for the number of tiny enterprise enabling applications built in .net to compare the shift in developer audience, but it seems too exclusive to base the total P0V for the previous community on forum/blog posts, those are probably new developers and developers excited about consumer experience features who are better served by wp7. To identify the split for the current audience, you can look at companies like motorola, intermec, etc who are sticking with 6.5 until they can figure out a windows embedded 7 compact strategy, or until enterprise features like a local rdms, private deployment, etc is supported on the wp platform. Somehow I doubt they’re going to “stick” with the old platform if it wasn’t selling. The conclusions from this article are idiotic. After one month of sales, WP7 is supposed to match Android and Apple’s installed base? With all the Android devices selling for free or discounted, it is obvious WP7 had to match those offers. That’s called competition in a tough economy. Android and iOS UI look dated versus Windows Phone 7. The development tools for WP7 are superior also. It’s Xbox vs Nintendo/Sony all over again. It may take years, but MS will grind it out. No offense to Chitika, but does their ad network really represent a fair sampling of websites that mobile users regularly visit? If these numbers had come from Google AdSense I would be more likely to believe them, but numbers from a third rate network like this are probably too small to be useful. This is a silly article at best and is an embarrassment to print! The article cites a company that puts out 31 million ad impressions. They get back only 110 Android and 172 iPhone responses – out of 31 million impressions. 73 million iPhones have been sold since it’s launch with 13 Million in the US alone. There are about 5-6 million presently active US iPhones and that only accounts for 172 responses. There are over 100 times more Android phones than WP7 phones right now and Androids only got 110 responses, which would mean that WP7 should have only 1 response at best! Then, they somehow try to extrapolate those responses to a phone that has only been out on the market for a little over ONE MONTH! So, Kevin, by that logic there are no Nokia or RIM smartphones out there at all? Please don’t use ad stats, or if you’re going to then use the likes of Smaato who are big enough and global enough to have a fair picture. They’re the worst form of conjecture going. I personally don’t like the WP7 UI and there seems to be no killer-stand-out-from-the-crowd WP7 phone yet. I think the UI is a bit too radical and average consumers might feel a bit uncomfortable or be too impatient to take the risk or time adopt this new UI. But this is purely my opinion. That being said, it is totally ludicrous to even attempt to make any assessment on the success or failure of MS’ strategy based on numbers from such an early stage of the game. So, how on earth is Microsoft going to stay in the mobile game, now that the Windows Phone 7 launch has flopped? Any handset model has greater sales at launch time than afterwards. All the Windows Phone 7 handsets released so far will thus decrease in sales, not increase. It’s Christmas time, and everyone is ignoring Windows Phones. What magical rabbit is Microsoft going to pull out of its hat to boost its abysmal sales? What reason is there for any retailer to keep stocking Windows Phone 7 handsets which don’t sell and nobody wants? Yeah, that’s why Android’s market share has plateaued. Oh, wait, it hasn’t. It’s grown nearly exponentially. You’re applying some faulty logic, which according to, Android’s launch also “flopped”. You are directly tying the OS’s success to the available handsets’ success. Yes, the sales of the handsets themselves will decrease over time, but new handsets will continue to be released. With each new handset, WP7 market share will increase. That’s how they will stay in the game; the exact same way that Android has. Be patient, proliferate to many handsets, be developer friendly, and update often. How is it a foregone conclusion that it “flopped?” Are you privy to the internal expectations set by the company? I’m not, and I work there. Your comments are completely unsubstantiated. The comment about launch being the greatest time for sales is just wrong. Android and iPhone both increased sales over time. Disclaimer: I work for MSFT, and I got my phone for free (plus one for my wife, since AT&T did the BOGO deal). That said, nulldev2010’s comment about the math is actually pretty encouraging. I work on the opposite end of campus from the cats who build the product, but I’ve met a lot of them, and they’re good people with great ideas. And if you believe the numbers posted in the press about the marketing budget (I have no idea what it actually is), I think it’s safe to say that the project is too big to fail. I also thing it’s incredibly silly to be comparing *any* sales number after one month to the grand sum total of everything already out there on Android and iPhone. Regarding the app store, I’d look around again. I saw a blog post (http://wpcentral.com/windows-phone-7-marketplace-hits-4-000-apps) about how it’s growing exponentially. I’ve yet to *not* find suitable replacements for everything I had on the iPhone. Even I’ve written an app out there! I was an iPhone user from the day it came out. I have to say, I was skeptical that Microsoft could come up with something great, but they did it. Sure, it’s rough around the edges, but if the rumors about an update next month are true, then that demonstrates a remarkable ability to iterate for a company that has historically been about “big bang” releases (see: Windows and Office). I’ve had my phone for a month, and I love it. The aggregation of social data is awesome. That it syncs contacts perfectly with Gmail is super convenient. The Zune UI is, to my surprise, superior to the touch iPods. The gaming experience is easily the best on phones because of the Xbox Live integration (great for achievement point whores like me). IMDB, Netflix and Weather Channel apps are a class above the iPhone apps. Whatever negativity you encounter about WP7, I can almost assure you it comes from people who intended to hate it before they used it, or simply haven’t spent any time with it. It’s just as good as iPhone and Android, and in many ways better. Given the relatively young market for smart phones, I have little doubt that it will succeed in the long run. Well said. I am a former Microsoft employee, and have used probably EVERY Microsoft phone ever released and WM7 is HUGE departure with less of the usual compromise. What is amazing to me is how people are so ready to discount the platform without using it, because it uses a Microsoft OS. That’s just ignorant! I’m awaiting my Dell Venue Pro, so I will soon be among the amazed and amazing WM7 users. People discount the platform because of their experience with Windows Mobile 6.5, 5.0…. Windows CE, Pocket PC, etc. Reputation counts for a lot. And with major features missing from the jump- copy&paste, multitasking, customization, flash/silverlight, turn-by-turn navigation, 4G speeds, slow upgrades (Windows Phone 8 isn’t expected until the end of 2012 per Microsoft) and so much more, why would anyone buy a product for the same price as devices that can do more RIGHT NOW to HOPE that MS will get it right at some future date? That’s fanboy talk, and most people are not fanboys. It’s already over for Windows Phone 7. Despite Microsoft’s refusal to comment, there is ample evidence of catastrophic market failure for Windows Phone 7. Ask your local phone store sales person. Windows Phone 7 handsets are not selling, hence the 2-for-1 firesale giveaway. There was another phone that had similar steep discounts soon after launch. It was called the Kin. Boy you sure must spend a lot of time trashing WP7. Apple/Android fanboy possibly? CNET named Samsung Focus one of the best smartphones of the year. Windows Phone 7 at v1.0 is better than Android and rivals iPhone. In the future can you put a little bit more effort into research and try to gather data from a few other orgs to actually build a solid argument/claim that WP7 is bombing based on web access stats. At a minimum a comment like, “I have inquiries into Admob, Millennial Media and Facebook, to see what their traffic shows for WP7 browsing share…” would go a long way in feeling that you didnt just jump on a bit of press nonsense from an ad/analytics shop, do a quick search to see what others have been saying for past couple weeks and spit out few paragraphs to make sure GigaOm was the first site today to have headline about WP7 being a failure. Wp7 is almost ad free, which is a good thing for the users. I don’t want to see the ads everywhere on my phone. I think it is pretty clear that most potential WP7 uesrs are patiently waiting for the hardware they want to arrive on the carrier they want. Unlike iPhone, WP7 is advertised to eventually be everywhere. Until all carriers are in, don’t look for large sales. Just wait until Nokia, whose CEO is an ex-MS guy, get their hands on the new Intel Atom System on a Chip. It will make the N900 look like an old XT. There are over 80M Android phones out there. 110:1 ratio between Android and WP7 would imply 700K+ WP7 phones out there. That’s actually more than most people have been speculating (cluelessly). Comparing the install base of Android and iphone against WP7 which is 5 weeks old and not even fully launched is plain silly. You need to focus on the market share of new phones being sold. Some app sales statistics suggest about a half is sold in the US. That makes it 700K/2 = 350K for one month for AT&T and Tmobile combined. That’s about 1M/quarter. AT&T and Tmobile sold only about 2.5M Android phones last quarter. Not too shabby for WP7. And the highly anticipated Dell’s Venue Pro for Tmobile hasn’t even launched in volume. Do you have a source for your claim of “over 80M Android phones out there”? I think this is a ridiculous claim. Total iPhone sales is about 75M (source: Wikipedia). Considering that not all units are sold to new users (people replace their old iPhone), there are much less than 75M iPhones “out there” (you still see people using iPhone EDGE? No). Now, there is NO way the total number of Android phones sold surpassed the total number of iPhone sold as we speak. Not even close. So it is impossible there are currently 80M Android phones out there. Give it a year or two, let it get its necessary updates and marketing to kick in and you’ll quickly see it on #2 spot close next to Android. Why, because RIM is dying fast, iPhone peaked out, Android will probably sustain its market share. It will be a duel between Windows Phone 7 and Android in near future. Microsoft really knows how to put their weight right behind something when they really mean it. Microsoft should just drop out of the portable media world. The Zune was a relative flash in the pan for MS and was at no point able to hold a candle to the iPod’s success. As far as phones, Windows mobile has been around since before Apple or Google’s devices and all but vanished once competition showed up. When it comes to mobile, Microsoft has never been anything but a bargain brand or ‘corporate approved’ name. Look at Google insights and compare android, windows phone, blackberry, ipad and windows mobile. Microsoft is throwing stones at the competitions’ aircraft carriers. I predict that 12 months from now Google’s market cap surpasses Microsofts. With the exception of the new info re ad impressions, nothing in this article hasn’t been said elsewhere more than a month ago – and much of THAT has been discounted. The 40,000 sales number was determined from an unnamed source who received it from an unnamed source, etc., and it has been repeated by bloggers across the internet who are too lazy to check it out. Would anyone be surprised to learn that web traffic for a new OS is less than that for two well-established OSes? Is that news? Does it matter? You could easily replace Windows Phone 7 with Android and you’d have a perfectly accurate article from a couple of years ago. Look at Android now! Instead of focusing on the features that WP7 lacks, it’d be great if writers would focus on how much features really matter to folks actually using the phone, how their phone experience is overall, and how interested people might be in using the phone as it matures. Features are features, but not all features are dealbreakers. After all, spellcheck is a feature that exists on even the most rudimentary word processor, and yet the author spells the word “incumbent” with an “a”. You are expecting too much from bloggers. Ballmer didn’t boast they’d sell 50 million devices. He actually only boasted they’ll sell 30 million devices in the first year. Now that sales have collapsed, Microsoft won’t even reach the 3 million mark with Windows Phone 7. Yes, it’s an epic fail. Only fanboys can tell a platform will fail or succeed now. See the statistics, the smartphone market itself is in its childhood days.If a fanboy thinks that they can make someone fail or succeed just by posting some bad or good comments, it will be childish and immature.Those days are gone where some blogger fanboy used to comment badly bashing some product can turn the balance sheet numbers of a company. Intention is either fanboyism or they think it will save their jobs. People who read these comments know who all these people are and what their vested interest is why they write blogs. I have been a iPhone user for long term, Android user for short term and now a Windows Phone 7 Samsung Focus user. I liked all the three devices. But if you ask, which one is better value proposition without doubt I would say Windows Phone 7. I dont think one needs much knowledge to say which one is better. I see in a year or so WP7 taking a sizeable market share . Only thing that can change this is if others come up with something new and solid like WP7, So as a consumer its good to have competition. The future looks equally bleak for all three. There are some stregths and weakness for everyone. I love to hate Microsoft, but just not taking any fanboy comments at facevalue, I could see Microsoft as the one who is in adominant position even in smartphone segment with there marginal market share now. Followed by Google and Apple. Cloud presence and bank balance makes all difference ,since a long term player in this domain will ultimately emerge as the winner. Being said that I think even Amazon and facebook like companies are second to none and forces to be reckoned with since we dont know what there plans are. Only time will tell. If you take a shorter term perspective Facebook and Amazon like companies where more innovative than any of this mega size players. At the end of the day what these junkies write doesnt matter . Take Microsoft itself , there is no other company which is bashed by fan boys thru the media. But still Windows 7, Kinect , Bing all are mega dollar success in itself. True that they had failed in KIN, Courier etc. Same is the case with Apple or google. They had their own failed products , But then there are iPhones , google search etc. So the more you experiment or fail with small projects, Fundamentaly these companies are getting into a stronger position to compete.Its not a good yardstick to measure the success or failure looking at failed projects which are of peanuts to these companies. Kincet and Bing are better examples here. See the market share they had initially and how they quickly learned and captured a fare share. Pretty sure same is going to be with WP7, from the fanboy comments and concerns itself you could easily understand that WP7 had started kicking butts of Droids and iPhone. But this doesnt mean that they had won. Its upto Droids and iPhone to come up with something compelling to compete with WP7. You have not listed a single good reason why WP7 will dominate the mobile world or catch up to iphone/android platform. As of right now, WP7 is scrambling to catch up to its android and iphone rivals, if you can call them rivals. Both iphone and android are coming out with killer app everyday, WP7 still waiting on Cut and Paste…. If anything, it’s up to WP7 to show they are good enough to stand on equal grounds with android and iphone. Actually – I thought he was spot on – he at least has clearly USED all 3 platforms a reasonable amount. SO have I and they DO all have strengths. THe cut and paste thing is so stupid. Only 1 in 100 users ever use it – literally – that is the number. And the other platforms took longer to add it than Microsoft is going to. The number of apps and desire to develop is a more serious issue. BUt it does look like Microsoft has drawn about level in terms of intention to develop although has a long way to go in app numbers. It is behind for range of apps and it is behind for web browsing. I’m pretty sure no conclusion can be drawn about sales for at least a full year – that’s about the time it takes for sales to ramp no matter what. The point about cut and paste is the fact that it should been built-in to WP7 from the start, not released later as a patch. It doesn’t matter if only 1 out of 100 user ever use it, it’s a function that every one expect to have on the phone in 2010. 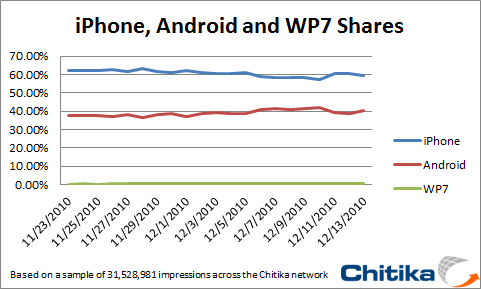 That’s why I mentioned WP7 is catching up to the other platforms rather than leading the other platforms. Also, no offense to you guys, is there any actual proof that you guys have USED all three platforms for a reasonable amount of time? Just because we have opinion on all three platforms is good indication of usage of all 3? Is 1 month usage of WP7 a good reasonable amount of time to form a good opinion on the platform as a whole? All in all, the data is the data, and it shows WP7 not doing well RIGHT NOW. That’s the bottom line. Who can say what happens down the road, maybe it goes to the kin route, maybe it become a mega success like xbox 360. 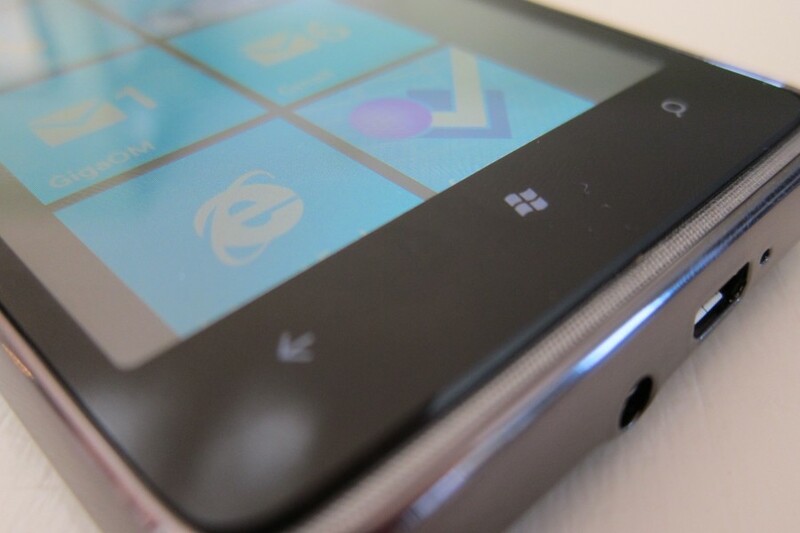 Until we have more hard data, there is no point in talking about how well the WP7 will do. Its official : Over 1.5m Windows Phone 7 sales in first 6 weeks confirms Microsoft. Please tell your take “WP7 is scrambling ?” . Even a school boy who had used all the platforms could straight away tell WP7 is superior as of now. I dont know about future, but right now it looks like Android not even comparable and iPhone comparable on some fronts but altogether WP7 is much much superior in UI framework, Gaming etc etc. Only comparable thing I could find is Marketplace and quality of build with iPhone. Yes iPhone marketplace is better, but we get better quality apps in WP7. Quality of build is very much comparable to iPhone. But I am stuck with my iPhone since I cant expect regular updates, but I hear from MS that update framework is solid and will get updates freely. Which makes it easier for them to compete now.